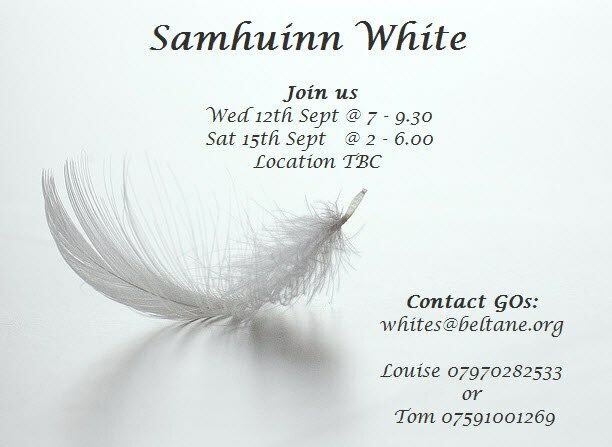 Louise and Tom’s Samhuinn 2012 Whites are still open to new members. Here’s some info about their group concept, how you can get in touch and the times for their open practices. The Whites represent order, focus, strength, nurturing, wisdom and purity. They were released from their duty when the May Queen and Green man joined together at Beltane. They have since spent the Summer dancing and celebrating with the Reds, exploring the love, joy and abundance that they share. However, the Reds are no longer full of vitality as they once where and the Whites are finding it difficult to nurture their beloved as they know that the Winter is drawing in. They follow the Summer King and the Queen seeking purpose through the change of the season. Confused as their main purpose in Beltane was to surround the May Queen and extend to the community, they do not yet know who she has become. They are ready to do what is needed and face their fears, using their strength and wisdom. Do they move into the darkness of Winter if it is needed in order to protect and nurture during this time? Or do they follow their hearts, and step back with Summer to rest and wait for their time to bring back the balance when the lighter days return. We will spend the weeks leading up to Samhuinn working together through ritual, meditation and character work to prepare for the changing of the seasons. The physical performance will be created through Butoh inspired movement in order to represent the essence of White and share our story. The group helps to shape the story and we will have a very close interaction with the Reds that will involve joint practices. This is a very committed group but also very enjoyable and fulfilling as the more that is brought from each person, they get even more back. If you would like to know more, please get in touch with Louise or Tom by emailing whites@beltane.org. Our open practices are on Wednesday 12th at 7pm and Saturday 15th at 2pm, we would love to see you there. Next Midsummer Nightmares…join their debauched ceilidh!